3XE Digital are delighted to be bringing Ireland’s internet sensation, podcast king, modern philosopher and all round social media legend, Blindboy Boatclub, to Croke Park to give his views on the digital world we live in and its relevance to marketing and online social interactions. This will not be for the faint-hearted, with Alan Coleman of Wolfgang Digital as compere! 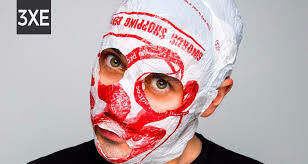 “I’ll be covering topics such as Blindboy’s second coming to fame, his views on the media’s role in society and culture, how he inadvertently created Ireland’s most successful Podcast with well over 250,000 regular listeners and why does a Limerick man wear a plastic bag from Swords on his head?”, stated Alan Coleman of Wolfgang Digital. These are just some of the reasons that over 500 marketing professionals are expected at the 3XE Social Media & Content Marketing Conference on 11th May 2018 in Croke Park in Dublin (www.3XEDigital.com). “At a time of social media turbulence with the likes of Facebook’s recent woes with data protection issues and yet the likes of Instagram and Snapchat have never been so popular, a conference like 3XE will answer all your questions about what works, what doesn’t and what the future holds for social media and how to utilise it successfully. There is no doubt that the advertising and marketing world has been turned upside down with both Google and Facebook now the two biggest “agencies” in the world. There really is only one known known and that is that good engaging content is what works and will get your message out – ultimately resulting in increased sales through social media. This is what the 3XE Social Media & Content Marketing Conference will concentrate on in Croke Park on May 11th”. Adrian Hopkins, Conference Director. 3XE Digital is the brainchild of Adrian Hopkins, recognised as one of Ireland’s leading conference organisers. Having developed, planned and implemented some of the country’s largest and well known conferences, including the annual Digital Summit Series, 3XE Digital is a series of in-depth tech conferences covering all aspects of digital marketing. Next ArticleWho is Liable When an Initial Coin Offering Fails?